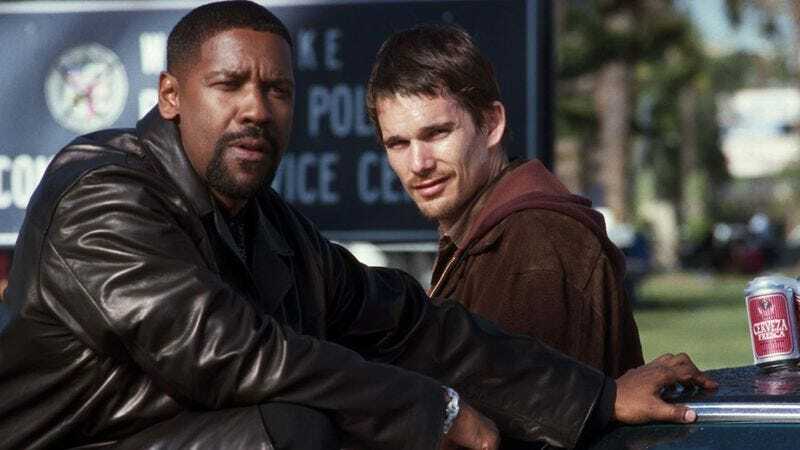 Deadline reports that CBS has won a four-way bidding war for that Training Day series that Antoine Fuqua only recently said he wants to do. The network has committed to producing a pilot for the show, which Fuqua will executive produce with Jerry Bruckheimer TV for Warner Bros. Fuqua is also directing the pilot with a script from TV and film writer Will Beall (Castle, Gangster Squad). As we previously reported, the Training Day series will follow the movie’s plot and feature a veteran LAPD detective who has to teach some rookie cop the ropes, i.e., corruption within the department, abuse of power, etc. But the series will give their doomed relationship a chance to develop, allowing for perhaps several good training days (and some narcotics) before reaching its deadly conclusion. The show will reportedly kick off 15 years after the events of the film and could also switch the races of the leads. Buddy cop shows haven’t quite taken the place of police procedurals in CBS’s heart/lineup, but the network certainly seems intent on stocking up on them. Although CBS recently said goodbye to the mismatched law enforcement pairing in Battle Creek, its Rush Hour series adaption is well underway.